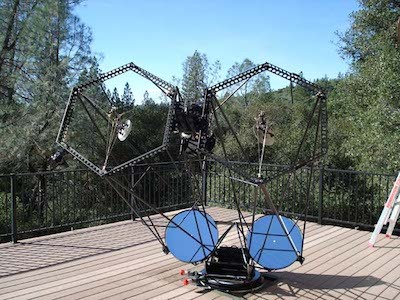 This Web site describes two of my Newtonian binocular telescope projects, a 14¼ " and a 22." I made this 14¼" (left) for travel to dark sky sites. It's easy to set up and packs inside my minivan. The 22" (right) was completed in August, 2003. 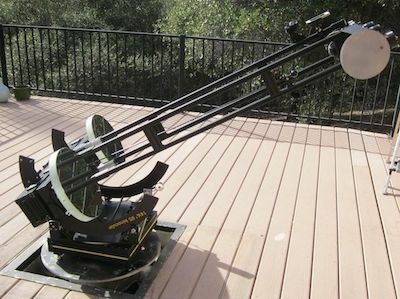 The 22" won a Merit Award at the 2004 Riverside Telescope Makers Conference (RTMC). It is among the largest amateur binoculars built. Because of the way our visual system works, a binocular telescope delivers exceptionally satisfying views. It provides levels of acuity, faint light detection, contrast and color almost equal to a monocular telescope with a 40% larger primary, with enhanced realism and much more viewing comfort. By effectively stacking the images from two eyes, our brain extracts information beyond the contribution of a single eye. Vision scientists call this process binocular summation. October 13, 2013: Completed detailed description of 14¼". November 6, 2013: Added photo of 14¼" packed into minivan for travel. Most thumbnail photos are links to larger images. Move the pointer over the thumbnail and hold it until a caption is displayed, then select to see the larger image. Except where noted, all photos are by the author.